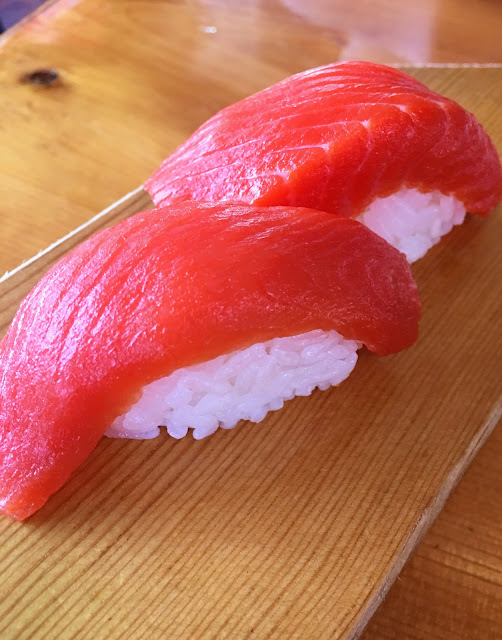 These beautiful slices of fresh, wild Sockeye or Red Salmon were a gift from the chef at Arctic Sushi in Anchorage, Alaska, after he prepared nine pieces of the melt-in-the-mouth salmon as sashimi, below, instead of the nigiri I had ordered. Great seafood often can be eaten raw or cooked gently with just a spritz of fresh lemon or lime juice. The meal at Arctic Sushi included a large California Roll. HACKENSACK, N.J. -- If you truly love seafood in all its many forms, you know fish, clams, oysters and other items don't even require cooking to be delicious. Take the melt-in-the-mouth slices of raw Sockeye Salmon -- one of the world's greatest fish -- I enjoyed at Arctic Shushi in Anchorage on the last day of our 15-day vacation in Alaska. For the second year in a row, I picked our vacation destination based on the seafood available there, because I stopped eating meat and poultry about 8 years ago. Last August, my wife and I spent 8 days in and around Reykjavik, Iceland, which offers an astounding variety of finfish from the pristine waters of the North Atlantic, plus the extraordinary langoustine or the tails of small lobsters. The level of cooking in fine-dining restaurants and bistros in Iceland is unusually high. You don't see as many finfish on Alaskan menus, but Iceland doesn't have fresh, wild salmon. Meanwhile, the port of Homer, Alaska, lays claim to being the Halibut Capital of the World (the flatfish can weigh up to 500 pounds), and the state is justly famous for its enormous Red King Crab. So, you can imagine my surprise when fine-dining restaurants in Alaska offered many heart-healthy fish or seafood dishes prepared with lots of artery clogging butter and cream, both of which I've tried to eliminate from my diet. When I cook seafood at home, I rely on extra virgin olive oil, garlic, tomatoes, pesto, Dijon mustard and fresh herbs to add flavor to fish, crabmeat and lobster. I also found that I had to ask kitchens in fine-dining restaurants in Alaska not to overcook my fish, with mixed success. And without fail, casual spots like Wild Catch Cafe in Whittier, where we took a 26-glacier cruise, and Cosmic Kitchen in Homer turned out juicy fish sandwiches or sliders with wild salmon or rockfish, a flaky white fish we don't see on the East Coast. And the wildly popular Glacier Brewhouse in Anchorage offered delicious lunch salads with smoked Alaskan Salmon and Pacific Shrimp. You also won't have to worry about butter or cream in your food at Tequila 61, a stylish Mexican gastropub downtown, where you can get guacamole and a trio of overstuffed wild-salmon tacos for lunch, washing them down with the Negra Modelo beer on tap. You'll still need your cholesterol medicine, though, especially if you choose fine-dining options. Bridge Seafood Restaurant, a showcase for Alaskan seafood in Anchorage, is built over Ship's Creek, and from many tables you can watch anglers trying to catch wild Coho or Silver Salmon, below. At Bridge Seafood on Aug. 8, an entree of Halibut was listed on the menu with Citrus Chive Butter ($43), and I asked the server to eliminate that and for the kitchen to cook the fish medium-rare. The fillet came with the large disc of butter melting on top, and another server whisked the plate off the table to have the kitchen make the adjustment. 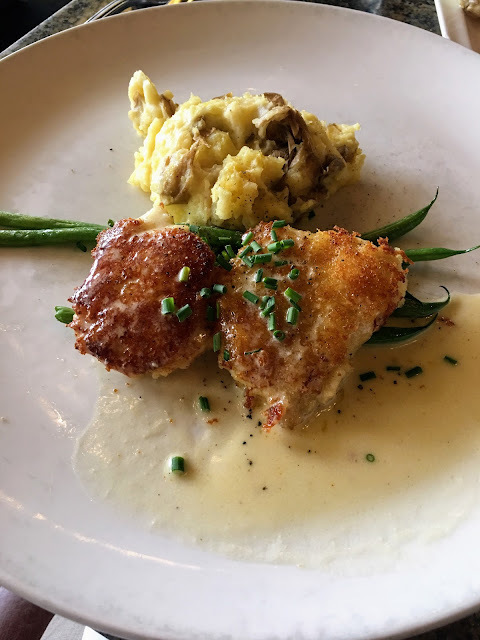 I had my worst experience on our second visit to Bridge Seafood Restaurant in Anchorage, where entrees come with seven complimentary seafood and other salads. That's why entrees are priced higher there than at other fine-dining seafood restaurants, but you can eat only so much salad. My wife ordered a half-pound of Red King Crab Legs ($42) with a double portion of vegetables (and, of course, those seven free salads). I ordered the Halibut Fillet cooked medium-rare with roasted potatoes, vegetables and salad bar ($43), but without the disc of Citrus Chive Butter listed on the menu. Well, it came with the butter, and another server grabbed it off the table and took it back to the kitchen. Instead of just scraping off the butter, the fillet went back on the grill to "cook" it off, and this premium fish came back overcooked and dry. I know I should have sent it back, but I just wanted to cry, especially when the check came and I saw an insert about Chef Patrick Hoogerhyde's Halibut with Wild Mushroom, Leeks and Lemon Vinaigrette (hold the butter). Why wasn't that entree offered to me instead of the bare, dry, overcooked filet of Halibut? Another problem was that on our first visit to Bridge Seafood on Aug. 1, we decided to share a special starter combo of Halibut, Rockfish, Crab Leg, Crab Cake and Alaskan Oysters ($40), and then hit the salad bar for another $19.95 each. But when we returned 7 days later, the a la carte price of the 7-salad bar had dropped to $12.95. My vote for the best seafood dishes in Anchorage goes to Simon & Seafort's Saloon and Grill, hidden away in the back of an office building with a gorgeous view of the sound. Reservations are a must, and the only negative is the din during the evening service, when conversation from contented diners enjoying wine and beer with their food combines with the shouts of an expediter calling out orders and the clamor of pots and pans in the open kitchen. We had our last big dinner at Simon & Seafort's, my pick for the best seafood dishes in Anchorage. My wife and I split two entrees, a sinful Seafood Fettuccine with Scallops and Shrimp ($30), above, and crab-like Halibut Cheeks with Asiago Cheese, below, supplemented with Norton Sound Alaskan Red King Crab Legs, not shown ($63). Before our shared entrees, I loved this appetizer of raw Ahi Tuna Poke with passion fruit coulis and sweet soy reduction ($16). 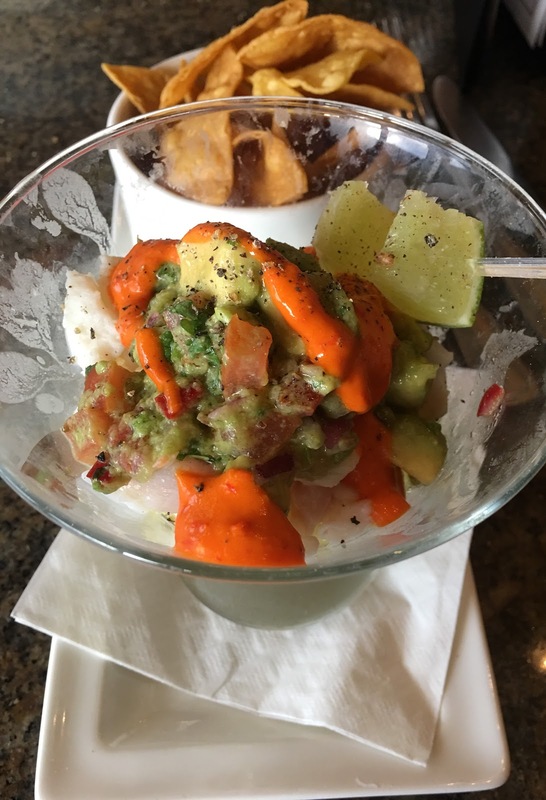 On an earlier visit, crispy tortilla chips came with another Simon & Seafort's appetizer, Alaskan Ceviche (King Crab, Halibut and Sidestripe Shrimp) for $18. in Palmer, Alaska, on the way back to Anchorage after driving to the Matanuska Glacier in Susitna. Turkey Red's owners say they operate the leading fresh-food restaurant in the farming community, serving high quality, local and organic ingredients. But the specials board displayed inside the door showed that many dishes were prepared with butter or a cream sauce. My server told the kitchen I had a dairy allergy when he ordered my Rockfish Special ($25) without butter (I don't). He did the same for my appetizer of Scallops with Pesto and Bruschetta ($15). My wife had another special, a grilled local Pork Chop with a mustard and white wine-cream sauce, apples and butternut squash ($26), but had to send it back to be refired when she discovered the thick chop was cooked medium-rare. 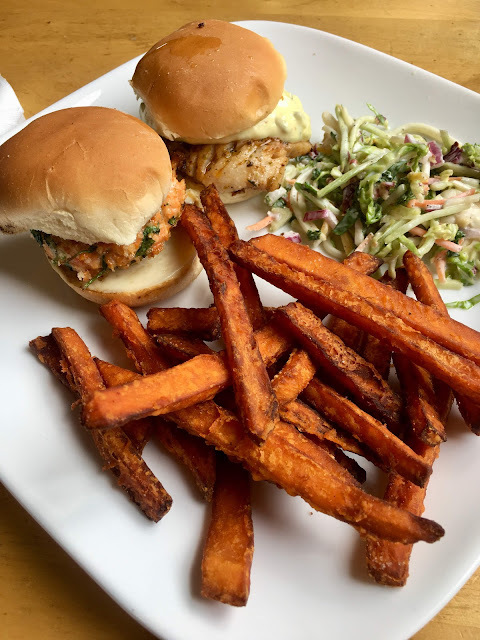 A juicy Thai Wild Salmon Slider and Blackened Rockfish Slider, served with sweet potato fries ($10.25), was the special of the day at Cosmic Kitchen in Homer. I asked for the delicious Salmon BLT Salad at Glacier Brewhouse in Anchorage to be made without bacon ($16.95), but when I found two bones around an inch or longer in the smoked fish, they took the item off my bill. My wife's salad with Pacific Shrimp, pineapple and clementine sections was $15.95, but she didn't like all of the corn starch used to thicken her cup of Salmon Chowder ($7.95).